A. Smith Bowman Distillery is an extremely small operation located in Fredericksburg, VA. They produce a variety of spirits, most notably their single barrel bourbon. While speaking with a tour guide during my first visit, I connected the dots on why I like this stuff so much; A. Smith Bowman receives double distilled bourbon mash from Buffalo Trace. They then distill the mash again and age it in Fredericksburg. A. Smith Bowman also stores the whiskey in a unique way; the barrels are stacked upright 2x2 on pallets. As they are such a small operation, this eliminates the need to turn/rotate the barrel and also allows for easy maneuvering of the barrels using a forklift. Nose: Loud with a savory bouquet of flavors. Toffee, mixed nuts, cinnamon sticks, and leather. Taste: Initial sweetness on the palate followed by a delicious and chewy spice. Candied pecans, black pepper, cinnamon/nutmeg, creamed corn, and charred oak. Finish: Smooth, long, and dry, with lingering toffee dipped oak. Conclusion: I was pleasantly surprised with this bourbon. The proof allows for a bold yet elegant bouquet on the nose and the taste follows suit. 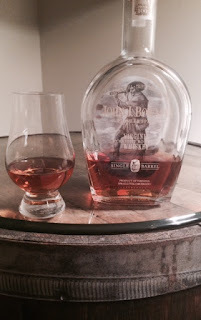 This is well balanced bourbon with a smooth finish. Slightly overpriced for an everyday sipper, but certainly something I will enjoy on occasion. The fifth bourbon expression from Barrell Bourbon has hit the shelves just in time for the Fall season. As the days are getting shorter and colder along the east coast, what better way to stay warm [and happy] than with cask strength bourbon! Nose: Initial waves of egg custard, sweet corn and fudge, quickly followed by spice, peanuts, and oak. Taste: Sweet from start to finish; almond nougat, cornbread, vanilla bean, Captain Crunch cereal, and tobacco. Finish: Dry and warming with hints of cornmeal, toffee and a slight spice. The heat is present but is expected given the proof. 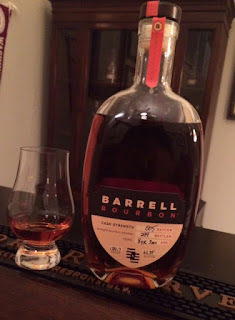 Conclusion: Batch 005 is a good whiskey curated from the people at Barrell Bourbon. It's a fairly sweet expression but has a decent complexity of robust flavors. At $83 a bottle, it's hard to recommend this over your daily drinker; I suggest trying before you buy if possible.